Service Agreements – Summit Heating and Air Conditioning LLC. 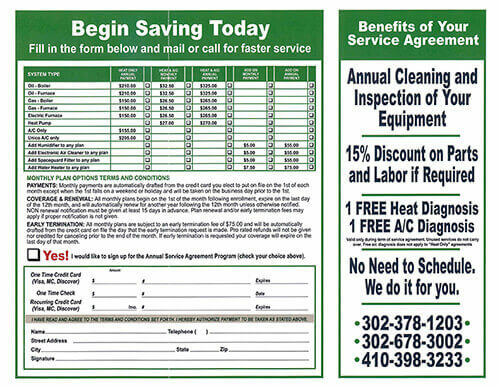 When you purchase a Service Agreement from Summit Heating and Air Conditioning you will receive an annual cleaning and inspection of your heating and/or air conditioning system, a FREE heating and/or cooling diagnosis, a 15% discount on any repairs that may be needed throughout the year, and priority emergency service. As an added benefit WE call YOU when it's time to schedule your preventative maintenance leaving you with one less task to tackle in your busy schedule. Regular maintenance and inspections of your equipment will ensure that you are receiving the highest efficiency possible from your system and are less likely to need unexpected, costly repairs. Purchase a Service Agreement today and have peace of mind knowing that your HVAC system will perform safely and efficiently when you need it most!